This is a plug in, reprogrammed replacement ECU for the 07 Japanese 4 door Civic Type R. It is not suitable for any US Civic. 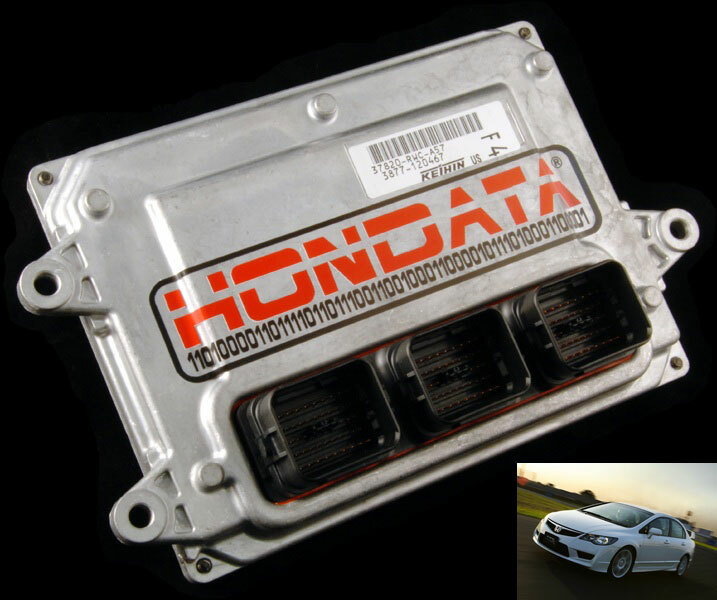 This ECU is available direct only from Hondata's international dealers. This is not a K-Pro and is not tunable. We have implemented a VTEC window from 5000rpm to 5700 rpm. Between 5000 rpm and 5700 rpm the K20a is on the low cam at part throttle switching to the high cam at full throttle. Power is gained in the midrange from 5300 rpm to 6300 rpm. Power gains above 6500 rpm are small, although the higher rev limit will raise average power a little. The following dyno chart displays power and torque before and after the installation of the Hondata ECU. Intake and exhaust were completely stock. The biggest gains are from 4000 to 6000 RPM with much smaller gains at the top end of the rev range. Dyno chart courtesy of CPL Racing. This dyno chart as provided by Driven Performance Singapore shows an FD2 Civic. Driven Performance also has a video of the dyno testing. This car was also completely stock. The Hondata Civic Type R reflash really shines when combined with an intake. The bottom red line is a completely stock Civic Type R.
The top blue line is the power and torque generated from the addition of an intake and Hondata Type R reflash. There are significant midrange gains from 4000 to redline. At 5800 RPM the torque increases 17% from 109 to 126 ft-lbs. The additional mid range torque released by the Hondata type R reflash makes the Civic much more drivable. How do I purchase the Group N ECU? Contact the closest international Hondata dealer to you. Hondata does not sell direct. 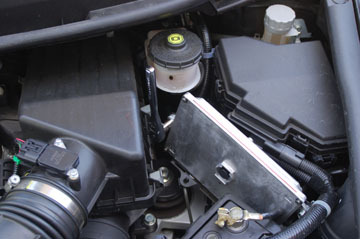 The ECU is located under a plastic cover to the right of the battery under the hood. You will need a 10mm socket. This is what it looks like - in place and removed from the car. There are 3 bolts holding the ecu in. You may find it easier to completely remove the battery, but you will need to enter the codes for your radio if you do this. This video also shows the ECU's removal. This ECU can be used with the FlashPro, but if you unlock the FlashPro and return to stock, the GroupN ECU will be returned to a stock US Civic Si ECU. In this state it will not work in the Euro and Japanese Type R Civics. Nitrous has not been tested. As ignition timing has not been significantly altered, nitrous is as safe (or as dangerous) to run with the reflash as with a stock ECU. Aftermarket cams have not been tested. For consistency in dyno testing we suggest you follow the dyno procedure outlined here. Any increase in RPM limit is at your own risk. If you suffer engine damage that is related to excessive revs Honda will not cover your warranty. Valve-piston contact, which typically occurs at 10,000 RPM is the result of a miss-shift. With regard to aftermarket parts, the law in the US is that warranty coverage cannot be denied simply because such parts are present on the vehicle, or have been used. For more details read the K series FAQ. You will need to check the laws for your own country.